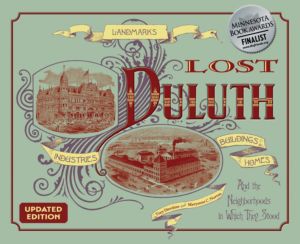 The Bay View House, Duluth’s first hotel, stood on the northwest corner of Superior Street and Fourth Avenue West from 1869 to 1888 when it was demolished to make room for the Palladio Building. Designed by Chicago architect Henry Raeder, the brick and stone office building stood eight stories tall. The first two stories were constructed of sandstone outfitted with decorative entrances on both Superior Street and Fourth Avenue West. Arched windows and a patterned brick frieze beneath the cornice further decorated the building. The Superior Street entry was particularly impressive. 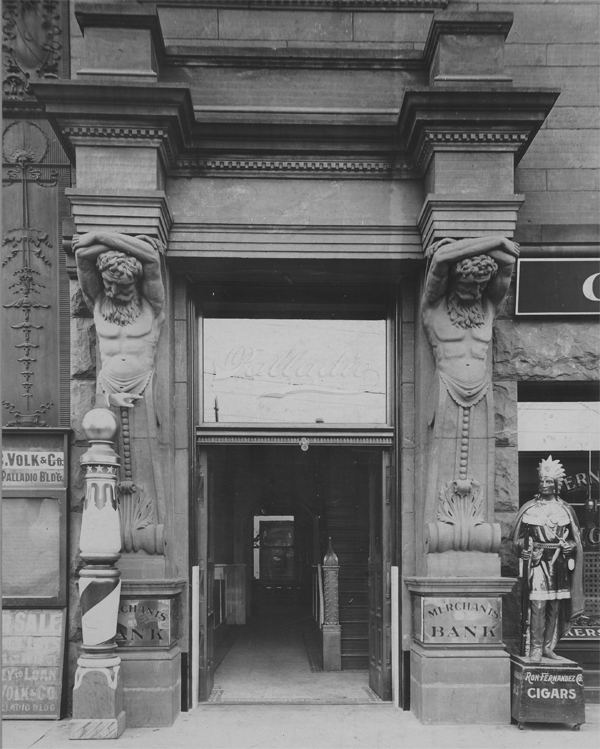 Columns on either side of the entry featured carved stone figures whose torsos appear to sprout from the stone. The muscled-and-bearded figures have their arms crossed above their head as if holding up the columns — and the building — themselves. Merchants Bank occupied the first floor for less than a year until it merged with First National Bank; professional offices filled the upper floors. In 1937 the Palladio was razed to its foundation and replaced with the three-story WEBC Radio Building, headquarters for the oldest radio station in the region, which first broadcast in June of 1924 with 50 watts of power. In 1928, when then-President Calvin Coolidge was visiting Duluth and Superior (he spent that summer on Wisconsin’s Brule River, fishing for trout) the station temporarily boosted its signal to 500 watts and joined the NBC radio network as a convenience to the president and his staff, who wanted to listen to coverage of the national political conventions. Because of this, the New York Times nicknamed WEBC “The President’s Station.” In 1968 the building was rededicated as the Palladio Building. It was demolished in 2015 to make room for the Maurice’s Headquarters building, dedicated in 2016.